Beautiful Chinese Celadon Nephrite Jade pendant as a Bi-Disc! A very attractive antique Nephrite pendant, Qing Dynasty, late 19th.-early 20th. century. The Disc made in a very nice celadon stone and carved as a flower motif with a dotted pattern inside. Size 54 mm. in diameter. Ex. Harald Bonde Collection, bought around 1930 in Beijing. A very nice Chinese Jade seal, the top carved as a Duck, 19th./20th. century. 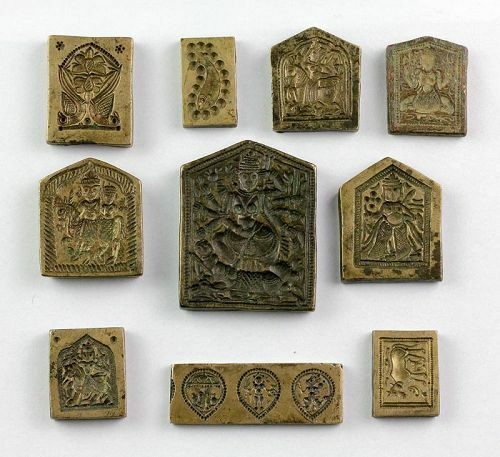 The seal finely carved with nice old style polishing and done in a mottled Celadon stone. Size: 30 x 30 x 50 mm Ex. Harald Bonde Collection, bought around 1930 in Beijing. A fine set of two white jade brush rests - gem! Pair of two matching brushrests, each engraved with 5 different figures holding flowers and animals. All in all 10 different figures likely with some symbolic or religious meaning. The two brushrests are carved from the same fine nephrite jade piece and surely made to belong together. 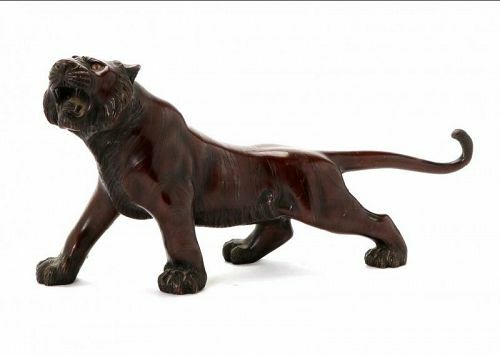 A wonderful Jade Nephrite pendant carved as a very elongated lion seated on a decorated rock, likely Qing Dynasty. A very accomplished jade carving in a white and smokey coloured piece of jade, polished to a glass-like degree. Ex. Old Danish Collection of Asian Antiques that we just aquired, collected from the 1950s to the 1990s. A fine quality antique Songachai gilt bronze Buddha, ca. late 19th. century. Beautiful massive Buddha seated on a high Throne with his arms resting on his large stomach. Finely details and with lavish guilding. Finely tone redish gold colour. Antique Chinese jade Nephrite pendant in the shape of a bead! Interesting inscribed Jade pendant in the shape of a rectangularrr bead, Qing Dynasty. 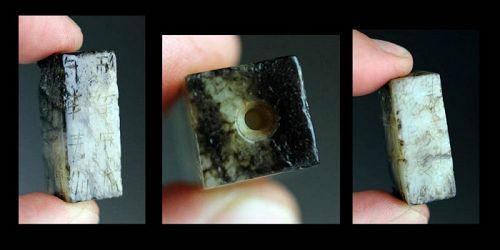 A nice rectangular carved and polished pendant as a bead with carved inscriptions in Chinese on all 4 sides. Condition: Intact. Traces of corrosion and old wear from use as a bead. Ex. Old Danish Private Collection, bought at auctions and dealers in Copenhagen in the 1980s-1990s. Rare set of 7 Jade, Nephrite pendants - beads shaped as animals! A very rare antique set of Jade beads or pendants, all shaped as different animals, Qing Dynasty 1644-1912. Sizes: Each animal is ca. 3,0-3,3 cm. long and they are all rather massive for their smaller length. A very cute old set that was perhaps stringed together as a necklace or a bracelet (?). Interesting inscribed Jade pendant in the shape of a 'twisted' rectangular bead, likely late Qing Dynasty. A nice carved and polished pendant made as a bead with carved inscription in Chinese on all 4 sides. Note that the design is a 'twisted' rectangular - we've never seen such a piece before. Fine Mottled white and black Jade. Size: 28 mm. high and rather thick. 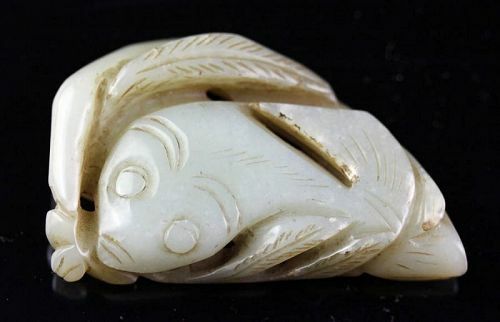 Chinese Jade Nephrite carving pendant of two fishes! 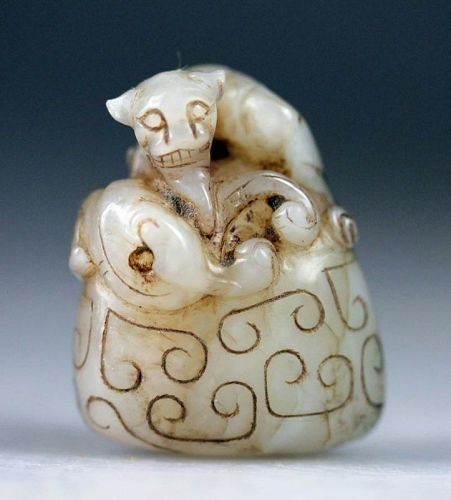 A good old Chinese Jade Nephrite carving pendant of two fishes and sea plants. In fine Celadon with old style handpolishing. Ex. Old Danish Collection, bought at Copenhagen dealers in the 1980s-1990s. 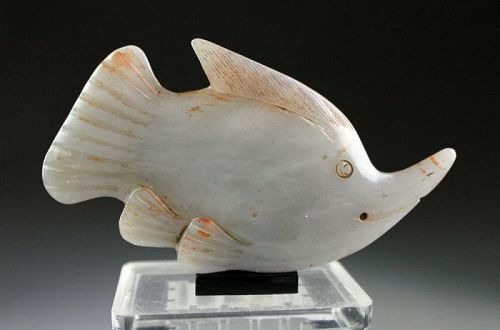 Beautiful Chinese Nephrite jade pendant of a fish! A beautiful Larger Jade pendant, shaped as a fish, likely 19th./20th. century. The pendant in terrific slightly transperant greyish-white jade with russet insclusions. The fish very detailed and well done. Size: ca. 10 cm. long. 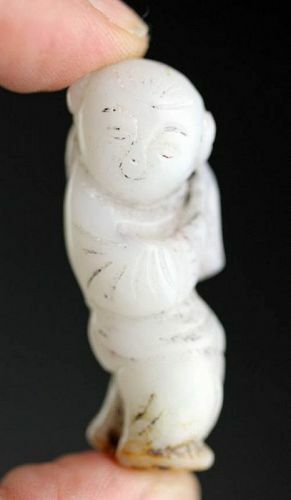 Antique Chinese White Nephrite jade pendant of boy with plant, Qing Dynasty. Fine pure white carving with nice details and patina. Ex. Old Danish Collection of Asian Antiques that we just aquired, collected from ca. 1950 to the 1990s. 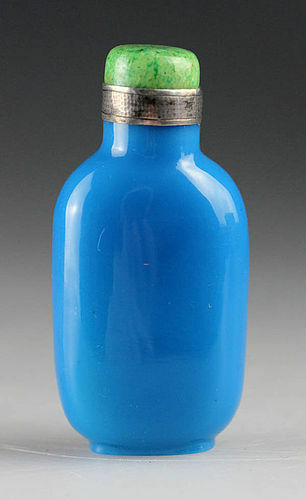 The bottle superbly polished and a real gem, with a green jadeite stopper and silver mount. 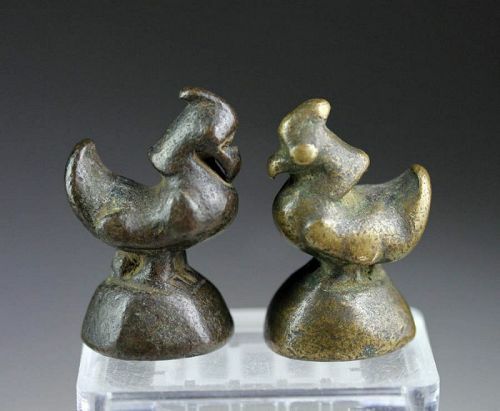 A pair of very early Opium Weights, denominal 10 Ticals, (weight approx 153 grams and 149 grams), Burmese ca. 1780. Nice Hintha birds of a good size, with fine brown patinas. Both on hexagonal stepped bases. 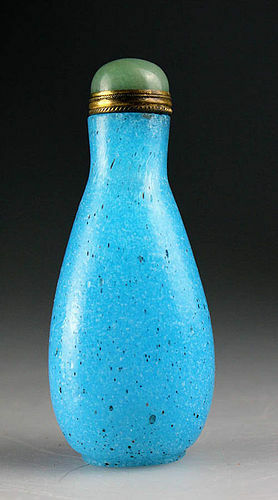 Condition: Choice, much smooth wear from use and nice patinas..
Translucent "Persian turquoise" blue peking glass, with a recessed foot and flaring neck, Xian Feng Period mark in the base (1851-1861 AD). The bottle superbly polished with bubble inclusions. Condition: Choice, very microscopic nible to rim.